I have mentioned this here before, but I’ll say it again. My mom is the queen of garage sales. Not only is she amazing at finding great bargains, but she also hosts garage sales of her own frequently. 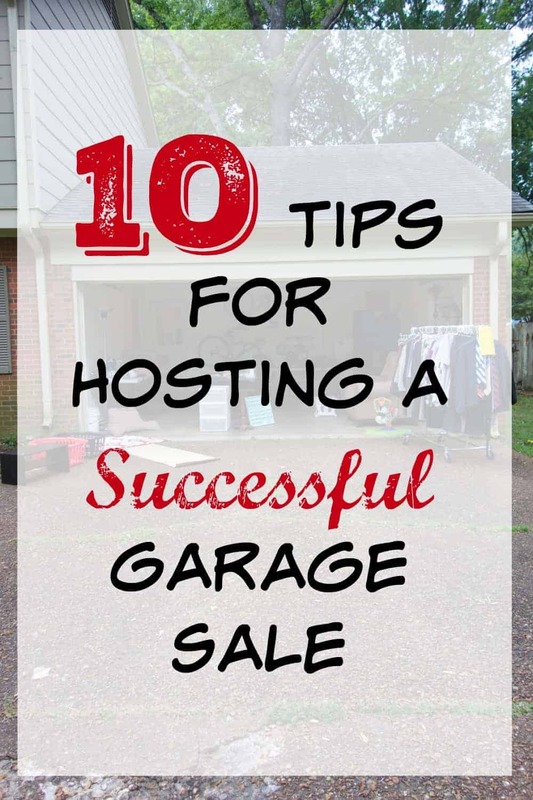 While I haven’t hosted nearly as many garage sales as my mom has over the years, I have picked up a number of tips for hosting a successful garage sale. Garage sales are really quite a bit of work. If you do it right though, you can potentially make good money off of them and get rid of a bunch of unwanted stuff all at the same time. Win-win! I actually just had a garage sale this past weekend. So, while it is fresh on my mind, I thought I would compile some of my best tips for success. When it comes to garage sales, the more stuff you have, the better. Often times, people will drive by, glance at the garage from the car, and decide from this very brief and distant glance if they want to stop or not. The more stuff you have, the more enticing it will be for people to stop. If you are wanting to have a garage sale, but don’t feel like you have much stuff, combine forces with a family member/friend. Have one or two other people bring stuff over to bulk up your garage. My mom almost always does this, and it’s usually pretty beneficial for everyone. Even if the bulk of your stuff is inside the garage, you will want to haul some things out to the driveway – a clothes rack, furniture pieces, larger toys, rugs, etc. This relates to the previous tip of the more, the better. If you have stuff in your garage and out in your driveway, it will make it more enticing for people to actually stop and come in. You need to organize your items and make sure everything is visible. Often times, I will go into a garage sale, and there will be a whole bunch of toys/books/clothes/etc. just dumped in a large box. Personally, I’m not one who will go digging through the box for a $1 item. If clothes are hung up on a rack in an organized fashion though, I will look through them. If toys are spread out on a table, I will take a look at each one. So, don’t lose potential money because you’re not organized. This is another one that frustrates me when I visit garage sales. I don’t want to have to ask you for the price of every single item in the garage. Put prices on items so that people know up front what you are hoping to get for it. Again, you don’t want to lose customers because you didn’t price things. Here is where a lot of people get hung up. You need to price things low. People who are shopping at garage sales are looking for bottom dollar prices. The lower your prices, the more you will get rid of. I like to think of it this way – I am asking people to come to my house, and then pay me money to haul off my stuff. These people are saving you the huge hassle of having to deal with it yourself. So, make it easy for them to do so, and price low. This is where it can get a tiny bit tricky. You want to price low, but you also need to understand that some people are going to bargain with you, or make you lower offers. Before you start, decide what items you are willing to go lower on, and which items you are going to be firm on. Be aware, though, that if you turn down an offer on an item, you may not get another one. When I give a garage sale, my philosophy is that any amount of money is more than I will get at Goodwill. So, I am usually willing to bargain on most every item. Many people will come to garage sales armed with $20 bills that they will then ask you to break for a $2 item. I actually had two different women this past weekend who needed me to break a $100 bill. So, you need to have plenty of small bills (particularly $1 and $5), and coins on hand. I usually go to the bank ahead of time and pull out a fair amount in small bills. It’s also not a bad idea to have someone else at home during the sale who can run to the bank for more small bills if you start to get really low. For this most recent garage sale, I advertised on craigslist and in a more localized neighborhood app. I, personally, have never advertised in the paper or on Facebook, but they are also good options. You will want to include time and date, as well as your address, in the advertisement. List a number of broad categories of items for sale (women’s clothes, tools, jewelry, books, small kitchen appliances, dishes, etc.) in order to attract a broad audience. You do not need to list individual items, unless you have something particularly noteworthy/rare/collectible/etc. And if possible, include some pictures. I always try to include pictures of larger items, such as furniture, in my advertisements. You want to put up plenty of signs to direct people to your sale. If there are multiple main roads that feed into your neighborhood, put up a sign at every one. Then, put up numerous signs within the neighborhood to point people in the right direction. They don’t need to be huge, but they do need to be visible. People also need to be able to read the words Garage Sale/Yard Sale/Sale on them, so they know what the sign is advertising. Extra note: Aim to put out your signs immediately before opening. This will help cut down on the number of early birds that show up. I usually try to start at 7:00 am. Though some of you may be thinking about clicking off this article after reading that, this really is key to success. Many regular bargain hunters are out early and done by mid-morning. You don’t want to miss so many potential customers, so get going early. My last tip may seem a bit random, but it’s actually a big one. Park on the street directly in front of your driveway, so that people cannot pull into the driveway. Number one, if people are parked in your driveway, your sale will be less visible from the road. And if you refer back to the earlier tips, you want your stuff to be visible so passersby are tempted to stop. Number two is something that may not be very likely, but can potentially be a bit of a horror show. Years ago, my mom had a woman pull into her driveway during a garage sale. The woman left the car running with her three young children inside. Somehow the kids managed to put the car into drive and drove into the house. Fortunately, the car did not go through the garage where people were shopping. I don’t think there was too much damage to the house, but the lesson was learned. Never let anyone pull into your driveway during a garage sale. As I said at the beginning of this post, garage sales can be a lot of work to put together. If you do it right though, it can be well worth it. You may make a fair amount of money, and you can potentially get rid of a whole lot of stuff in one fell swoop. If you have been contemplating hosting a garage sale, I hope these tips help to get you going on it. And I hope your sale is wildly successful! Garage sales are so much work! It’s great to have advice from an experienced person! They are a lot of work! It can be well worth the time though. Thanks for stopping by! Very good advice and also be ready to ask for a lower price, but respect other and don’t do a low ball. Yes, that’s true. If you are shopping, don’t be afraid to make an offer. You sound like you are an experienced garage saler. 🙂 Thanks for looking! These are great tips, Amy. I’m getting ready to have a garage sale in a few weeks and I’ll keep these in mind! I’m visiting from Happy Now Link Party. Oh, good luck! I hope you do well, and get rid of lots of stuff! It’s always nice to have other people haul away your unwanted items. 🙂 Thanks for taking a look! The starting early part always kills me, but you are so right. That’s when a lot of people are out buying. Thanks for all the great tips. Especially parking in front of your driveway. I never would have thought of that. I know. I’m not a fan of starting early either, but there really are so many people out that you don’t want to miss. Thanks for stopping by! I don’t think it’s an issue that many people would consider, until something bad happens. It’s great that you block your driveway off, though. So, you don’t have to worry about it! Thanks so much for taking a look! Great tips! We are about to hold a mega one next weekend. Waaaaay overdue! I enjoy shopping at them, as well! There is always a rush early in the morning, so if you want a chance at the good stuff, you’ve got to get out early. 🙂 Thanks for stopping by! Thank you! It’s so much easier to shop when things are organized. I don’t even like digging through store racks that are a mess, much less garage sale bins. Thanks for taking a look!